Still looking for a good pulley? Try this one, quality pulley with reasonable price. THREE YEARS GUARANTEE: This product is guaranteed for three years against any faults in materials or manufacture. Notice: This pulley cannot be used on cable. Light and Compact. Weighs only 78 g / 2.75 oz, the micro pulley could be stowed anywhere and take no place in your rack. Ball Bearing. Sheave mounted on sealed ball bearing for smoothly rotate and efficient work. Easy to Use. Thanks to its mobile side plates, the installation and remove of rope will be easier. Reliable. Rated up to 30kN, the swing cheek pulley also gets CE certification. You can count on it completely. Versatile. 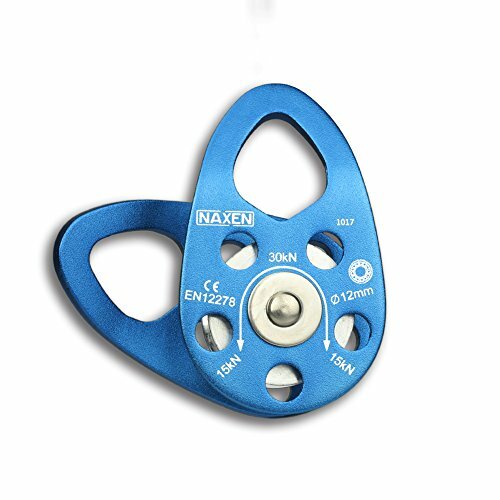 Suitable for rock climbing, rescue, caving, arborist, pulley system and many other applications. If you have any questions about this product by NAXEN, contact us by completing and submitting the form below. If you are looking for a specif part number, please include it with your message.